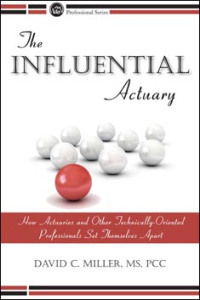 In The Influential Actuary: How Actuaries and Other Technically-Oriented Professionals Set Themselves Apart, author Dave Miller interviewed four actuaries who, in his estimation, achieved great status in their careers and made tremendous impact both in their organizations and the industry. Among these interviews, the importance of one specific skill is repeated over and over again: communication. We're happy to share those interviews with our readers in an excerpt from the book below. This spring, Dave Miller is presenting a series of webinars with ACTEX on Actuarial Leadership & Communication. Learn more. Q: What has set you apart as an actuary? Laura: I think it comes down to communication. That is not synonymous with being with being an introvert or an extrovert. I'm talking about communication skills. The more ability you have to pull yourself out of the technical jargon and put yourself into the position of the person with whom you're communicating, the more powerful you will be in whatever you're trying to accomplish. All actuaries have technical foundation, but the ones who get noticed are the ones who have really nailed the communication. Mike: I think the single most important characteristic, attribute, or competency is the ability to understand the other people's position, the ability to understand how they feel and what's important to them, what incenses them, what causes them to be disappointed. It's putting yourself in the other person's shoes. That's whether you supervise or are working with a client, it's beings sensitive to the other person's position. It's more than empathy. It's actually putting yourself in the other person's shoes, understanding his or her position so that you can serve them better. You can then add value. Being sensitive to the other person's, to your clients' to your employees' needs is the single most important success factor. Then, the second is the ability to communicate and be persuasive. If I were to give advice on what kind of training in which actuaries should engage, the most important kind of training you can get is sensitivity training. Sensitivity training is the single, most important life experience I have ever had for assurance of success as a consultant. It taught me that I need to pay attention to the other person's needs and sensitivities. Jim: Well, one thing that people have told me at various points in my career is that I am "an actuary who can communicate". It took me a while to fully appreciate what they meant, but I'd say that my ability to communicate is perhaps the biggest single factor that set me apart as an actuary and what has given me many of the growth and development opportunities I've had...The ability to communicate is critical because it can open up opportunities for actuaries to contribute beyond the actuarial scope. It all starts with a willingness to be seen not just as an actuary... We want and need to be seen as fully contributing and integrated members of the business leadership team. Bob: Early in my career, I realized that I needed to work on my communication skills. This became apparent when I was asked to be the head of the company's bowling league. At the beginning of the bowling season, I gave a presentation to the bowling group, to tell them a bit about what we would be doing in the bowling league that year. To be honest, my presentation was not good. I think that the group may have wondered what I was talking about and if they made the right decision to have me leading the group that year. I'm sure they thought, "He's a nice guy, but he communicates like an actuary." So, I made it a goal to, whenever I had an opportunity, work on communications, written and verbal, that could help set me apart from other actuaries. I know that a lot of actuaries do not like to get up and speak in public or their written communication is not good. They can do a great job with spreadsheets but then communicating what they've done in a short memo is not very effective. The key point to remember is that effective communication is something that can be learned with a lot of practice. Q: What kinds of things hold actuaries back? What kinds of things hurt the reputation of actuaries? What things give them a "bad rap" or are impediments to their success? Laura: As actuaries, our training is highly technical; it's introverted by nature, meaning it's a lot of self-study. I think preparing for exams is a lonely process in which you sit by yourself, you take them, and then you tell a few people that you passed, but it's not a sharing experience. What you're doing in a working environment is almost the opposite of your entire technical training. I think sometimes actuaries think that their technical acumen and performance should speak for itself and they'll automatically get noticed. I'm not saying get noticed in the sense of bragging. I'm saying get noticed in the sense of "Hey, I'd like to do that, or this may be an opportunity for us I can help with." Mike: Actuaries are generally introverts. Even if they have the capability of not being so, it's comfortable for them to live in a world where they don't have to manage people, personalities, and relationships. It's very hard work to do that. People come in all sizes and flavors. Actuaries are stereotypically boring. You want to break that stereotype. Jim: I think part of it is communication. Dave: Not being able to communicate in layman's terms? Jim: Not being able to communicate in an invigorating fashion. People need to be interested in the speaker and excited about what they are hearing if they're going to listen. I remember when I was at Penn Mutual. Tom Styles (CFO) had just joined the company from Prudential Bache and his knowledge of the life insurance industry was limited. John Tait (CEO) wanted me to help him. So I took him to an actuarial meeting, and then, the next week, I took him to a LIMRA meeting. What a contrast! The actuarial meeting was so very dull: " We're going to tell you about mortality and we're having some regression problems." But the LIMRA meeting was alive and energetic! As an actuary, it was embarrassing for me to have Tom witness the difference and painful for me to witness it with him. I'd say that the best thing we can do for the "actuarial community" is to improve how we communicate and how we deliver our messages. These four interviews can provide valuable insights for actuaries. Further excerpts of these interviews are included within The Influential Actuary book. Specific themes emerged. The competencies that set certain actuaries apart from the pack do not seem to be technical prowess or quantitative skills, because these are a given. Rather it is communication and people skills. It is the ability to sell, lead and add value. All of these things can be summed up by the word "influence." For more on this topic, check out Dave Miller's ACTEX webinar Influential Actuarial Communication. Laura Hay is currently a partner and U.S. Insurance Leader with KPMG. She was also the first actuary at KPMG to serve as lead partner for a large client company. She is dynamic and is a tremendous leader, as well as a very successful business developer. Jim Avery is now retired, and was formerly CEO of Prudential's domestic Individual Life Insurance business and Agency Distribution channel. Bob Beuerlein is the current President of the American Academy of Actuaries, and a past president of the Society of Actuaries (2006). He has more than 35 years of experience as an actuary and is currently a consulting actuary based in Florida. Mike Gulotta founded Actuarial Science Associates (ASA) which later merged with Aon. He ultimately became Chairman of Aon Consulting U.S. One of Mike's claims to fame was a front page article in the Wall Street Journal that featured him as American's most exciting actuary. His firm, ASA, grew from $2 million to $150 million in revenue in a 15-year period under Mike's direction. He is now retired. The above text was adapted from The Influential Actuary and was reprinted with the permission of David C. Miller and ACTEX Publications. All rights are reserved.